Here's another seasonal item I picked up at Target. While I still have a decent array of pumpkin items in my stash, I was really hoping for some more savory snacks. Does anyone know of some savory seasonal items that are on the shelves? (The harvest salsa, which I reviewed last year, and pumpkin soup mix were the only items I could find.) Please send me a MESSAGE if you spot anything seasonal and savory that I should review. 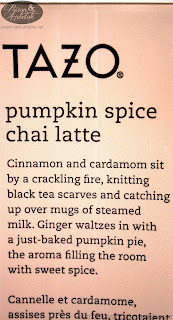 On to today's review, Tazo Pumpkin Spice Chai. This packaging is very similar to the peppermint soy milk I reviewed last Christmas. 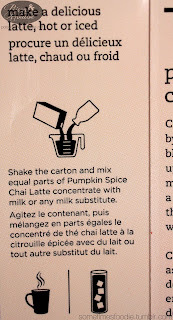 It is a waxy, foiled, cardboard container that has been folded into a carton with a plastic pour spout. (A lot of pre-made soups, broths and stocks use the same packaging.) The package design is simple, but very well done. A lot of effort was put into the typography while the images are very basic and cropped to create visual interest. I really love the look of this product. 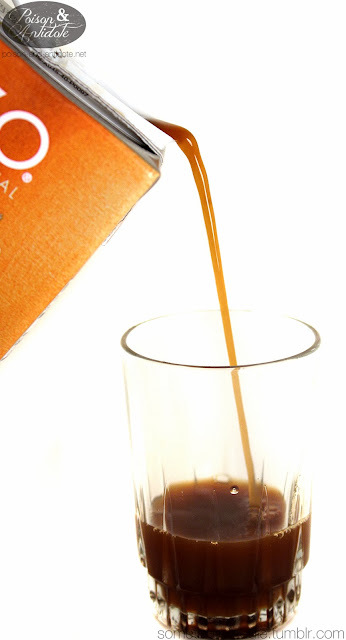 At first glance you might think that the product is a little small and overpriced, but this is actually a concentrate. 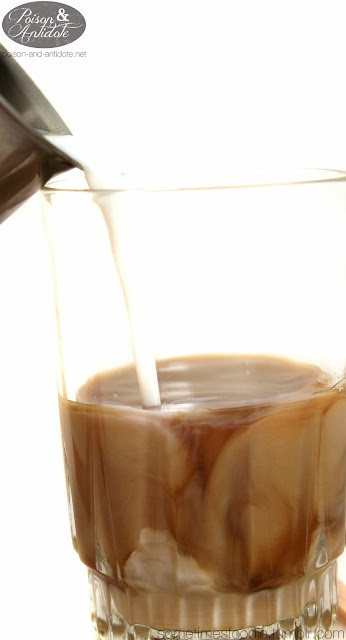 You are meant to mix one part chai with one part milk (or any milk-substitute). Even so, it's still a bit on the pricey side. 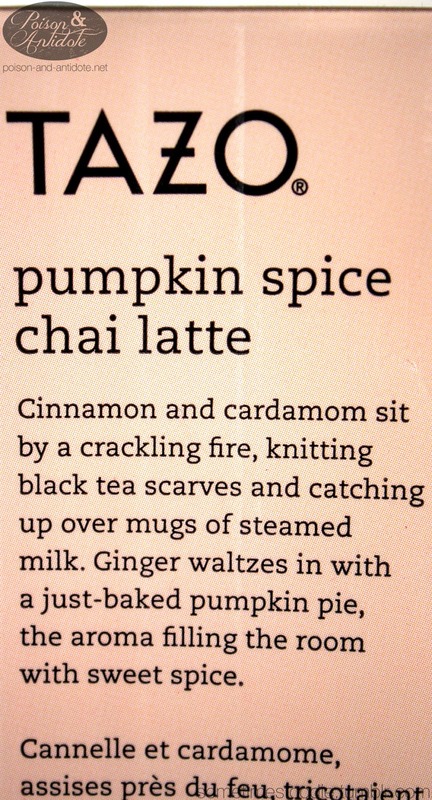 Tazo was a tea company that was purchased by Starbucks, I'm not too familiar with their pricing before or after the purchase, so I can't really say prices have gone up. I started out by shaking the container, as per the instructions, and pouring the concentrated chai mixture into a glass. (The carton was refrigerated, since I prefer my lattes cold/iced.) The tea was very thin, dark, and heavily spiced. 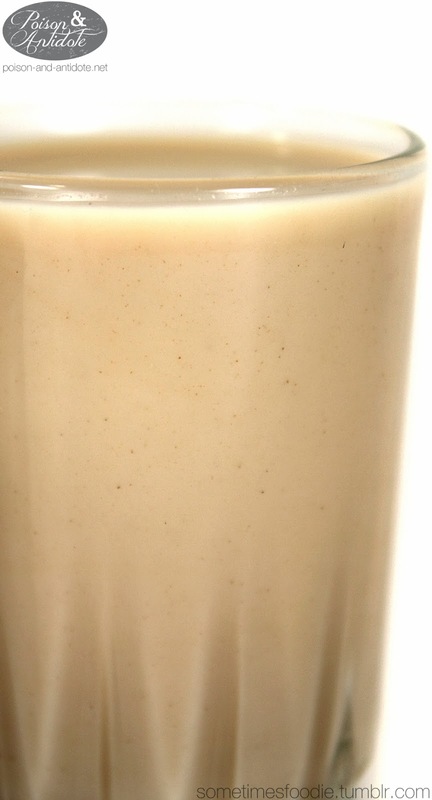 You can actually see little specks of the various spices floating around inside the glass. Since I am using whole milk, I decided to smell the concentrate before and after mixing. 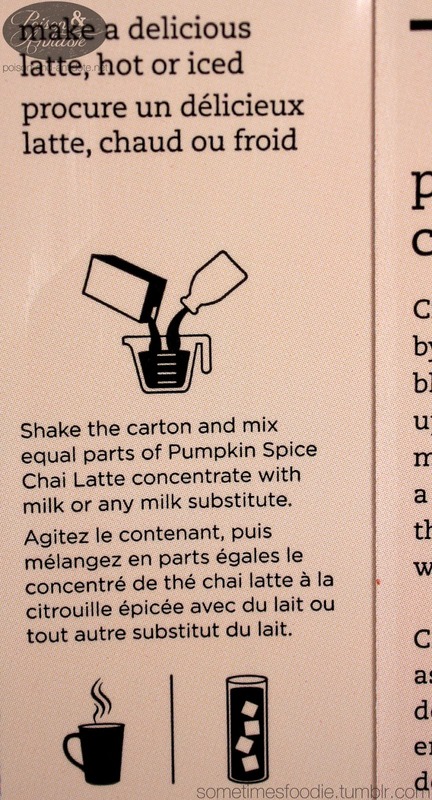 In it's own, the liquid smelled like pumpkin pie filling. There were a strong, spicy, aroma that was undoubtedly the pumpkin pie spices and it was really well balanced. After adding the milk the aroma was a little bit weaker, and it started smelling more like gingerbread than pumpkin pie. This stuff is delicious! Even though it is a bit on the expensive side, I really recommend it. 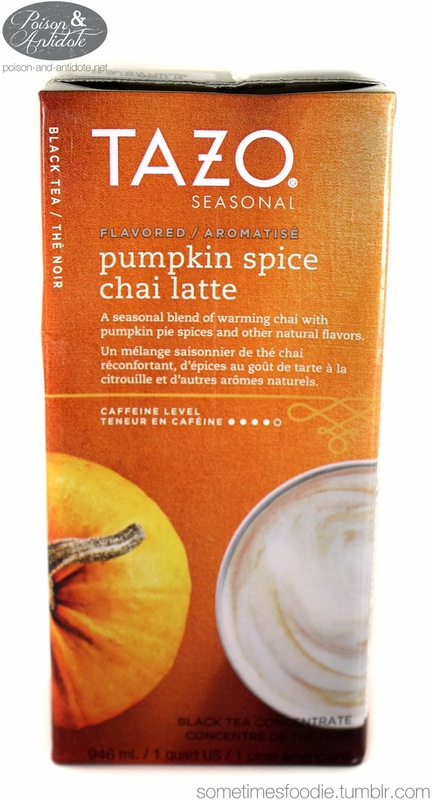 On a Pumpkin Scale of 1-5 (5 being the most pumpkin-y) I’d give this a 4 and it's really yummy for an instant chai tea.